The Firebee AR Parka offers outstanding warmth and weather protection, but weights in at only 615 grams, providing you with unbeatable warmth and at minimal weight. It is insulated with 850-fill goose down, and has an outer shell of Gore Thermium which is windproof, water resistant, and highly breathable. 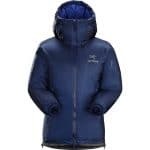 Please note that if traveling to Aconcagua or Denali, this parka will serve well as an overparka - please call or email to discuss how you will add insulation to make this garment functional on your expedition.